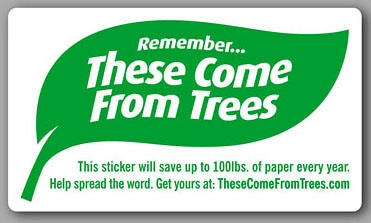 These Come From Trees Blog: These Come From Trees for Eco-minded Citizens! Thank you for these awesome stickers! I just requested some using the Education Challenge. Any chance these stickers can be available in Spanish? Not yet! But they're translated into Italian, Arabic, and Turkish. Would you like to translate them? Email us at thesecomefromtrees@gmail.com to discuss! Don't the stickers also come from trees? Do you have stickers to stick on your stickers? Anonymous...don't be a jackass! The benefit outweighs the sacrifice. I noticed one of your stickers in a gas station bathroom while traveling across country. I'm from New York and the sticker caught my eye in Wyoming! TCFC rules.